The two main adventure games I've played in VR so far are Vanishing Realms and The Gallery - Episode 1: Call of the Starseed. The Gallery is a game that a lot of people told me blew them away, and I thought it was alright. But I actually had a couple technical glitches in it and that probably affected my overall enjoyment. It was a great proof of concept about how good a VR adventure game can be though and I appreciate that about it. Vanishing Realms is another story. I absolutely loved it! It's a true dungeon crawl with atmosphere, puzzles, inventory, gold, treasure, swords, shields, enemies, skeletons. 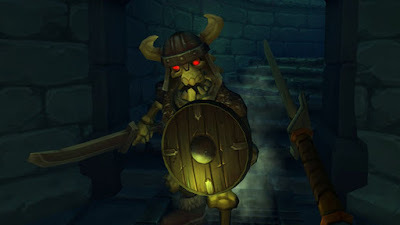 All the typical (and stereotypical) things you would expect from a classic fantasy dungeon crawler are here but once you set that in VR it becomes a thing of magic. I loved actually swinging a sword around and blocking with a shield. I liked holding a torch to light my way or look in dark areas. I liked reaching into my side pouches to get things out of my inventory. I really really liked Vanishing Realms and I hope we see more games like it. I know we're still in the earliest days of VR but these two games alone prove to me that adventure games could become a huge VR genre.